I biked with a friend today all over the bay area of Roxas Boulevard. We started from the SM Mall of Asia in Pasay City all the way to Manila (the capital city of the Philippines) and back. It's been a long time since I've done this and it was a nice experience especially because the sun wasn't shining. This picture was taken in front of the monument of our national hero, Jose Rizal, at the Rizal Park, where today I dicovered is across the KM 0 (kilometer zero) marker or the city center. halloooo!!! so now u are back to your hometown! Hmm.. I am planning to go for a short and budget trip.. is there any nice beach resort which you recommend in the Philippines? Pls let me know if you have any idea(drop comment at my blog pls). cool!!! biking is 1 of my frustrations. my parents never let me ride bikes... i'm glad you had fun!!! wow biking,thats nice.good for the health and no gas fumes at all! Hi Jasper. Thanks for the comment. I think I wrote something in response to that. 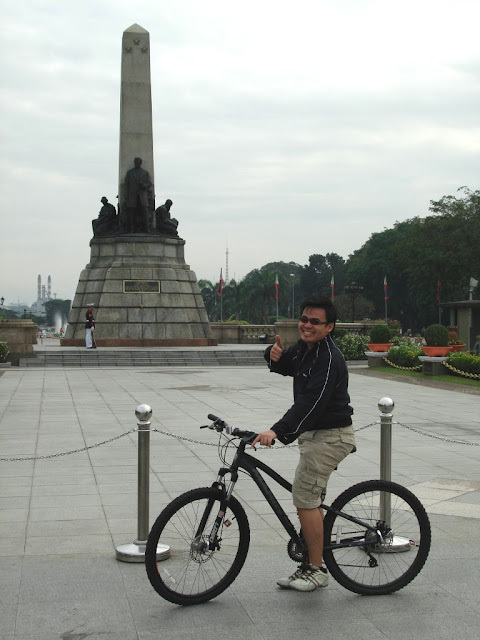 Anyway, I never "biked" in Manila before, but I bet it's such an exciting trip to go back and forth Manila. Good thing you got yourself home in "one piece" considering the traffic jam, the daze and the haze, and all that stuff in the city. I am planning to go to Singapore this sem break. Around May then Phils for about 3 days. Haha! Nice to see your Beijing post. The bird's nest is such a beautiful structure.